My friend, Stephanie, who blogs over at latenightquilter.com, and I have decided to host an exciting event we’re calling the Supernova Friendship Block Swap, and we’d like you to join us! 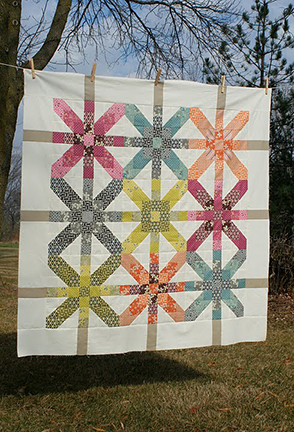 By sewing along, you’ll end up with a gorgeous Supernova quilt of your own and make a wonderful friend in the process. Photo from Freshly Pieced; used with permission. Stephanie and I also figured there might be a few people like us who missed out on Lee’s original QAL, so we are reviving it with a new twist. A making friends twist! Here’s the idea: to learn more about each other and deepen our friendship, each time we send our surprise package with a new block in it, we’re also going to include a few details about ourselves. Each month we’ll add a couple of questions on our blogs for all of us to answer and give to our partners. With my experience as a journalist and Stephanie’s as a psychologist, you can bet we’ll have no trouble coming up with some interesting ones! By the time we finish the quilt, I’m sure we — and you and your partner — will have developed a wonderful friendship. What’s not to love about that? 1. Find your partner. It can be someone who lives nearby or far away, but ideally, it should be someone you don’t know well. Neither you nor your partner needs to have a blog to participate. Just leave a comment on this post if you’d like to join us. Provide a link back to your blog (if you have one) or your email and we’ll include your name on our Supernova blogroll. 2. Choose a combination of colors, e.g., blues and golds, black and white, warm or cool, or a fabric line to use in your blocks. Check out the site Design Seeds if you’d like help with picking a beautiful palette. 3. Each month you’ll make two identical Supernova blocks — one you’ll keep and the other goes to your swap-pal. Your pal will do the same thing for you. The deadline to send your first block to your partner is June 15. The remaining blocks will be due July 15, Aug. 15, Sept. 15 and Oct. 15. Your finished quilt will be a combination of blocks from you and your new friend, making it truly special. 4. 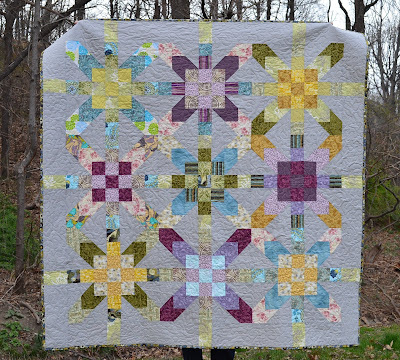 Hop on over to Freshly Pieced for the fabric requirements and the guidelines for planning, cutting and piecing your blocks. Lee has already spelled out all the details for us, so it couldn’t be easier. Stephanie and I will post tips and tricks along the way. 5. If you’re a blogger, write a post announcing your plans to participate and be sure to link back to either this post or Stephanie’s announcement so we can get the word out to as many quilters as possible. 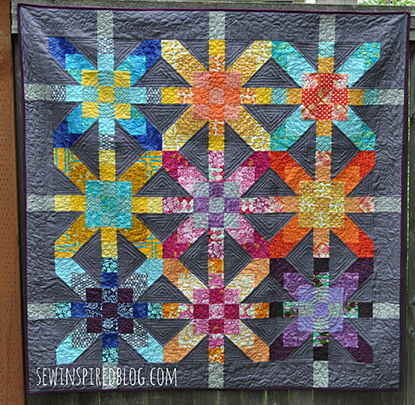 You can also copy the Supernova Friendship Block Swap button found on my sidebar and add it to your blog. 6. When you send your first block, be sure to include your list of 25 things your quilt partner doesn’t know about you. They can be as silly or as serious as you would like. Here’s an example by TV’s ultimate fixer, Olivia Pope, aka, actress Kerry Washington. 7. For bloggers, when you post your progress each month, include at least one new thing you learned about your partner (with his or her permission, of course!) from our follow-up questions, and include links back to Stephanie’s and my blogs. 9. Make a new life-long friend and end up with a gorgeous Supernova quilt to memorialize the development of a beautiful new bond. 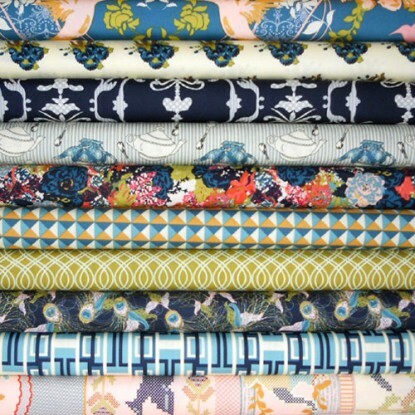 Here’s the cool palette: (photo from Moona Fabrics on Etsy where I purchased the warm palette. They’ve got lots of great choices. Since the blocks are so large (18″ unfinished), we’ll each make five, or two per month; one to keep and one to send. That’ll give us the nine we need for the quilt top and an extra block to use on the back, or to use for a mug rug or even a mini-quilt. Supernova by Patrick at Straight Stitching Singer. If you haven’t seen either Patrick or Vicki’s blogs, check them out. There’s lots of inspiration for this project and others, too. Well, what do you think? Are we crazy, or does this sound like fun? Please join us and send a comment today. If you don’t have someone in mind to partner with, you can leave me a comment with your basic style (modern, traditional, transitional) along with colors or fabric lines you love. Stephanie and I will keep track of the singles and try to make some friendship matches. If you leave me a comment about participating and you don’t get an email back from me within 48 hours, then you’re probably a no-reply blogger. In that case, I’ll reply directly to your comment on the blog asking you to send me your email. Hopefully, you’ll check back and see it — I don’t want to miss you! I like the way the grey background was used with the bright fabrics. I agree, it’s very pretty. Thanks for stopping by! Hi Shanna: Glad to have you along! Shoot me an email at onemillionstitches@gmail.com if you need help finding a partner. Just let me know what style of quilting you prefer so Stephanie and I can make a good match. I would love to join & be paired up, thank you!! I love using colorful trendy/modern fabrics. Hi Stacey. You can find the fabric requirements here. As soon as I get more singles interested in finding partners, I’ll let you know. Do you care if it’s someone national or international? ooo I am so tempted. I don’t have any idea about who could be my partner but hopefully someone who loves font fabrics (even though I’ve never used one, I’m desperate to get some), deep lush colours like Viki’s quilt in this post. I’m in the UK, so would prefer someone here or the postage and customs charges will make it far too expensive. diwarli.blogspot.co.uk – this hasn’t been kept up to date but it’s a start of a reference point, although alot of it was cardmaking/scrapbooking to begin with. My friend and I want to join the fun. That’s great, Maya. Just send me an email at onemillionstitches@gmail.com with an idea of your style and if you want to swap in your home country or internationally. Thanks for joining us! I’d love to join in too! I need a partner. I am new to blogging (I’ve only written one post, just last month!) I will do my best to learn how to insert all your stuff. I’m at stitchesbrew.wordpress.com. Great! Glad to have you join us. I’ll contact you by email soon. I would like to get in on this wonderful supernova friendship quilt. That’s great, Susan. I’ll send you an email soon! This sounds like fun! I’d love to join, and right now I’m flying solo! I blog occasionally at http://www.theravenscraft.blogspot.com – mostly during the summer as I’m out of work! I’m open to US or international, and I’m located in FL. Hi, Emily! Thanks for joining us and we have quite a few people looking for partners, so there should be no problem pairing you up. Give me an idea of the fabric lines you like (or colors if you prefer solids or a combo deal) and we’ll get you started. Send me an email at onemillionstitches@gmail.com! That’s great! Just send me an email at onemillionstitches@gmail.com and let me know if you need a partner, and if so, what kind of fabrics you like. If possible, be specific about them. Once I have that info, Stephanie and I will do our best to pair you with someone compatible. I would like to join…need a partner. I would like to join How do you join. Hi, Barbara: Just send me an email at onemillionstitches@gmail.com and let me know what your fabric preferences are, i.e., style, designers you like, modern or traditional, etc. Also, let me know if you’re willing to trade with someone in the U.S. or internationally. After I’ve heard from you I’ll be in touch with a possible match. Thanks for joining us! I would like to join and I need to be matched up with someone. My blog is http://springcreekartsguild.blogspot.com. I live in Central Texas but would like to be matched with someone far, far away. Palette-wise, I’m thinking blues, greens, greys, etc. My style is eclectic–meaning I just like quilts, all kinds of quilts. Hi, Cathy: I think I have just the person for you – she’s in Ireland! I’ll contact you both by email and you can decide if you’re a good match together. Thanks so much for joining us. I’d love to join! No partner-and a very old blog. I will set up a new one for this though! Oh also–I like traditional designs with modern fabrics. 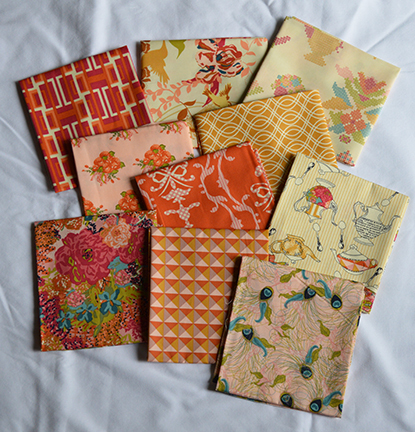 I do have a ton of vintage fabrics also-I have been collecting vintage strawberry prints for a while. This might be the perfect quilt for a strawberry patch! Hi, Anett! I’m sure we’ll have lots of people interested after Lee’s post today, so I’ll be back in touch soon. Thanks for joining us. Kitty and I are going to partner up and join in the fun. That’s great, Mary Ellen. Glad to have you both! Is it too late to join up? I’d love to dive in to my first cyberspace quilting venture. I don’t have a partner, either. But I will send you particulars at your onemillionstitches email, if that is ok. What a great idea! Hi, Ellen: It’s definitely not too late. I’ll watch for your email and will be back in touch soon. Thanks for joining us! This sounds fun. I would love to join if it’s not to late. I do not have a quilting partner. I’d love to participate, but I don’t have a quilting partner. They’d have to be willing to send internationally to Sydney, Australia, though! Have I missed getting a partner? Okay I met up with a local gal Jen (http://jenniferunderthejunipertree.blogspot.com) that I know from her blog and we are going to give it a go. That’s great. Looking forward to seeing your blocks. Hi- I would like to join. I don’t have a blog or a partner. International is good. Thank you for having this swap.